Titanium; Nanoparticles; Gastric Cancer; Apoptosis. We sought to determine the effect of TiO2 nanoparticles on apoptosis and invasion of gastric cancer cell line, MKN-45. We used the MTT assay and a wound healing assay to assess invasion and acridine orange and ethidium bromide (AO/EB) staining to test cell death. We used seven different TiO2 structures: Polyethylene glycol (PEG)-amorph TiO2, amorph TiO2, PEG-brookite, rutile, anatase, amorph bovine serum albumin (BSA), and brookite BSA. Anatase and rutile are two important TiO2 structures. Rutile is more stable and bigger than anatase.19 All nanoparticles were used at different concentrations (0, 10, 20, 30, 40, and 50 μg/mL), and the cells were exposed to the nanoparticles for 24, 48, and 72 hours). Human gastric cancer cell line MKN-45 (NCBI No.C615) was purchased from Iran Pasteur Institute. The cells were cultured in RPMI 1640 (Gibco, Invitrogen GmbH, Darmstadt, Germany) included 10% fetal bovine serum (Gibco, Invitrogen GmbH, Darmstadt, Germany), 100 unit/mL penicillin and 100 μg/mL streptomycin at 37 °C in a humidified incubator with 5% CO2. Amorph, brookite, anatase, and rutile forms of TiO2 nanoparticles (Grafen Chemical Industries, Ankara, Turkey) were coated with PEG and BSA. We used the MTT assay to examine cell survival. MKN-45 cells were seeded in a flask; when the concentration reached to 60%, cells were trypsinized and moved to a 96 well plate. Each well contained 5000 cells in 200 µL RPMI 1640 medium. Cells were cultured for 24 hours after which they were exposed to the nanoparticles. Different concentrations of nanoparticles (0, 10, 20, 30, 40, and 50 μg/mL) were used for three different times (24, 48, and 72 hours). On the day of testing, 20 μL of MTT reagent was added to cells and the contents of each well were replaced with 100 μL dimethyl sulfoxide. Absorbance in each well at 570 nm was recorded using the Elisa reader system (Rayto software). Each experiment was triplicated. The results of the MTT assay were used to calculate the 50% inhibitory concentration (IC50). MKN-45 cells were seeded in six-well plates and incubated with nanoparticles at the IC50 value for 48 hours. AO/EB reagent at 100 μg/mL was prepared, and cells were trypsinized and stained with 100 μL of AO/EB solution for 15 minutes and washed twice with phosphate buffered saline (PBS) solution and assessed by fluorescence microscopy. Green color indicated live cells, red represented apoptotic cell, and orange indicated necrotic cells. A wound healing assay to examine the migration of MKN-45 cells was done. MKN-45 cells were seeded in six-well plates. After 24 hours, the center of well was scraped with a sterile micropipette tip to make a straight scratch with the same width. Each well was washed with PBS solution, and MKN-45 cells were exposed to TiO2 nanoparticles (at the IC50 value) and moved to an incubator for 48 hours. 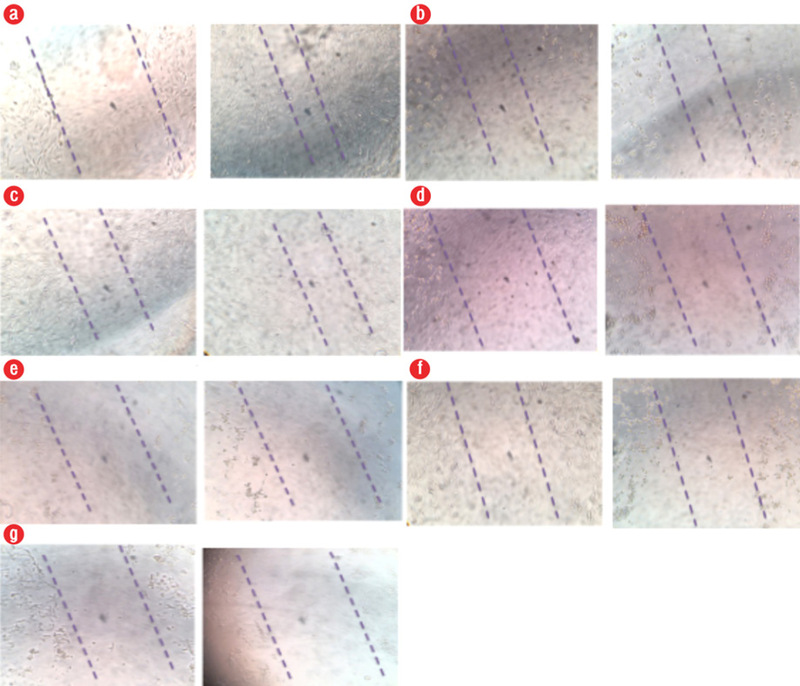 Wound closure was recorded with an inverted microscope. Each assay was triplicated, and data expressed as the mean. Statistical analyses were performed using SPSS Statistics (SPSS Inc. Released 2008. SPSS Statistics for Windows, Version 17.0. Chicago: SPSS Inc.). Graphs were prepared using Microsoft Excel 2007. After normality and homogeneity evaluation of variables, analysis of variance (ANOVA) was done with a 95% confidence interval (p ≤ 0.050); Tukey's test was used for multiple comparisons. Figure 1: Effect of different configurations and coating of nanoparticles on the proliferation of gastric cancer line, MKN-45 (a) amorph titanium dioxide (TiO2), (b) polyethylene glycol (PEG)-amorph TiO2, (c) anatase, (d) PEG-brookite, (e) rutile, (f) brookite bovine serum albumin (BSA), and (g) amorph BSA. Figure 2: Induction of apoptosis in cancer cells after exposure to different configurations and coatings of nanoparticles for 48 hours. In all groups, the concentration used was the 50% inhibitory concentration (IC50) value. Apoptosis, left (control), and right (IC50 dose at 48 hours). Green color indicated live cells, red apoptotic cells and orange necrotic cells. (a) polyethylene glycol (PEG)-brookite, (b) amorph titanium oxide (TiO2), (c) PEG-amorph TiO2, (d) rutile, (e) anatase, (f) brookite bovine serum albumin (BSA), and (g) amorph BSA. MKN-45 cells were exposed to various forms of TiO2, and cell viability at 24, 48, and 72 hours with different concentrations of nanoparticles was evaluated using MTT [Figure 1]. In the PEG-amorph TiO2 nanoparticles group, increasing concentration and exposure time led to an increase in cell toxicity (p ≤ 0.050). For PEG-amorph TiO2, the most toxic effect of nanoparticles was at concentrations of 50 μg/mL at 24, 48 and 72 hours. In the amorph TiO2 group, nanoparticle toxicity was the highest at a concentration of 30 μg/mL for 72 hours. In the PEG-brookite group, the highest toxicity levels on cancer cells were observed at 40 μg/mL for 72 hours. In rutile, anatase, amorph BSA and brookite BSA groups, the highest toxicity to cancer cells was at a concentration of 50 μg/mL nanoparticles for 72 hours. Nanoparticles caused cell death in the MKN-45 cancer cells. In previous studies, nanoparticles caused cell death by activating the intrinsic apoptotic pathway.16 Apoptosis in MKN-45 cells was tested using AO/EB staining [Figure 2]. After exposure to TiO2 nanoparticles, we saw cell death (p ≤ 0.050). In all cases, the nanoparticles concentration was 50 μg/mL and MKN-45 cells were exposed to nanoparticles for 48 hours. The percentages of apoptotic and live cells in the control group were 10.0% and 90.0%, respectively, and the percentages of apoptotic and live cells following exposure to TiO2 nanoparticles are given in Table 1. Table 1: The percentage of apoptotic and live cells following exposure to titanium oxide (TiO2) nanoparticles. PEG: polyethylene glycol; BSA: bovine serum albumin. Invasion of cancer cells after exposure to nanoparticles was evaluated using wound healing assay. We saw an increase in cell invasion in the PEG-amorph TiO2 group compared to the control group, and a decrease in cell invasion in the brookite BSA group (p ≤ 0.050). Our results suggest that different configurations of nanoparticles have different effects on cancer cell invasion. We saw no significant changes when using amorph TiO2, PEG-brookite, rutile, anatase, and amorph BSA nanoparticles [Figure 3]. Figure 3: Effects of different configurations and coatings of nanoparticles on cell invasion. In all groups, concentration was 50% inhibitory concentration (IC50) and cells were exposed to nanoparticles for 48 hours. Migration test (qualitative test) left (control) and right (IC50 dose at 48 hours). (a) polyethylene glycol (PEG)-amorph titanium oxide (TiO2), (b) rutile, (c) amorph TiO2, (d) anatase, (e) PEG-brookite, (f) amorph (bovine serum albumin) BSA, and (g) brookite BSA. We studied the effect of TiO2 nanoparticles on gastric cancer cell line MKN-45. Different configurations and different coatings of nanoparticles were used. 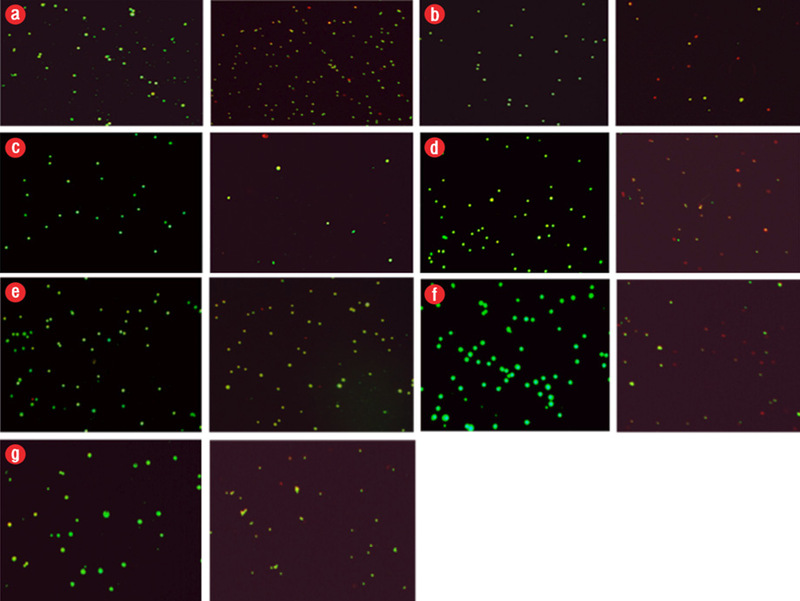 Cell proliferation was significantly decreased in all nanoparticle groups. The reduced proliferation and increased concentration and nanoparticle exposure time have a direct relationship. It has shown that TiO2 nanoparticles can enhance the sensitivity of tumor cells to radiation therapy through ROS production in vivo19 and they have the potential to be implemented in the near future in clinical trials. Different forms of TiO2 nanoparticles reduce cell proliferation and viability in gastric cancer cells. The inhibitory effect was enhanced by increasing the nanoparticle concentration and exposure time. As nanoparticles induced cell death in cancer cells and decreased cell invasion in the brookite BSA group. Brookite BSA has the most inhibitory effect on cancer cells, and we suggest that this group be investigated further in in vivo models. According to these results, TiO2 nanoparticles have the potential to be used as a new therapeutic agent for cancer treatment in the future. We would like to thank the deputy of research and student research committee of Semnan University of Medical Sciences for providing facilities to this work. 1. Jemal A, Bray F, Center MM, Ferlay J, Ward E, Forman D. Global cancer statistics. CA Cancer J Clin 2011 Mar-Apr;61(2):69-90. 2. 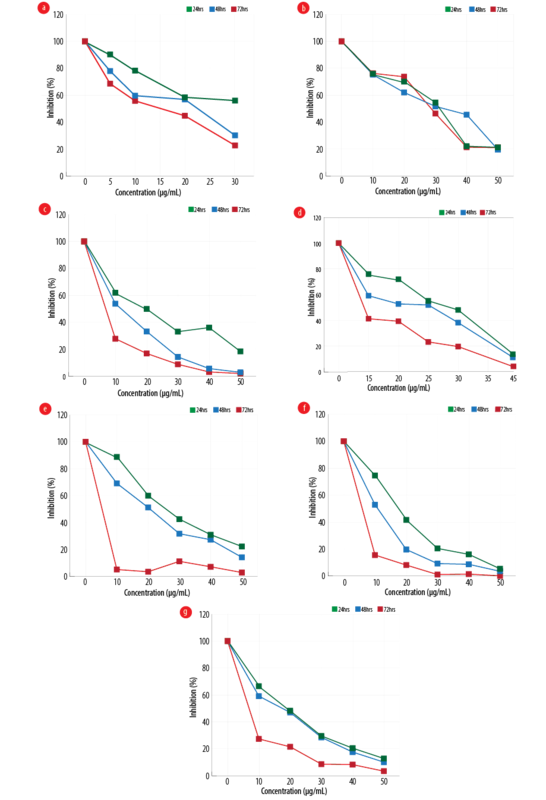 Jemal A, Siegel R, Xu J, Ward E. Cancer statistics, 2010. CA Cancer J Clin 2010 Sep-Oct;60(5):277-300. 3. Kolahdoozan S, Sadjadi A, Radmard AR, Khademi H. Five common cancers in Iran. Arch Iran Med 2010 Mar;13(2):143-146. 4. Dolat E, Hasanzadeh H, Tavirany MR, Semnani V, Arfaee AJ, Seyyedi S, et al. Evaluation of radio-sensitizing effect of TiO2 nanoparticles on human gastric cancer cell line. Journal of Ilam University of Medical Sciences 2013;20(5):121-128. 5. Esmaeillou M, Moharamnejad M, Hsankhani R, Tehrani AA, Maadi H. Toxicity of ZnO nanoparticles in healthy adult mice. Environ Toxicol Pharmacol 2013 Jan;35(1):67-71. 6. Rezaei-Tavirani M, Dolat E, Hasanzadeh H, Seyyedi S-S, Semnani V, Sobhi S. TiO2 nanoparticle as a sensitizer drug in radiotherapy: in vitro study. Iran J Cancer Prev 2013;6:37-44. 7. Sharma V, Shukla RK, Saxena N, Parmar D, Das M, Dhawan A. DNA damaging potential of zinc oxide nanoparticles in human epidermal cells. Toxicol Lett 2009 Mar;185(3):211-218. 8. Ren F, Bhana S, Norman DD, Johnson J, Xu L, Baker DL, et al. Gold nanorods carrying paclitaxel for photothermal-chemotherapy of cancer. Bioconjug Chem 2013 Mar;24(3):376-386. 9. Dolat E, Hasanzadeh H, Tavirany MR, Kashl SH, Arfaee AJ, Seyyedi S-S, et al. Evaluation of synergistic effect of TiO2 nanoparticles and gamma rays on human breast cancer cell line. Journal of Ilam University of Medical Sciences 2013;20(4):223-230. 10. Barreto JA, O’Malley W, Kubeil M, Graham B, Stephan H, Spiccia L. Nanomaterials: applications in cancer imaging and therapy. Adv Mater 2011 Mar;23(12):H18-H40. 11. Maadi H, Moshtaghian A, Taha MF, Mowla SJ, Kazeroonian A, Haass NK, et al. Multimodal tumor suppression by miR-302 cluster in melanoma and colon cancer. Int J Biochem Cell Biol 2016 Dec;81(Pt A):121-132. 12. Veiseh O, Gunn JW, Kievit FM, Sun C, Fang C, Lee JS, et al. Inhibition of tumor-cell invasion with chlorotoxin-bound superparamagnetic nanoparticles. Small 2009 Feb;5(2):256-264. 13. Kalbacova M, Macak J, Schmidt Stein F, Mierke C, Schmuki P. TiO2 nanotubes: photocatalyst for cancer cell killing. physica status solidi (RRL). Phys Status Solidi Rapid Res Lett 2008;2(4):194-196. 14. Seo JW, Chung H, Kim MY, Lee J, Choi IH, Cheon J. Development of water-soluble single-crystalline TiO2 nanoparticles for photocatalytic cancer-cell treatment. Small 2007 May;3(5):850-853. 15. Thai SF, Wallace KA, Jones CP, Ren H, Prasad RY, Ward WO, et al. Signaling Pathways and MicroRNA Changes in Nano-TiO2 Treated Human Lung Epithelial (BEAS-2B) Cells. J Nanosci Nanotechnol 2015 Jan;15(1):492-503. 16. Shi Y, Wang F, He J, Yadav S, Wang H. Titanium dioxide nanoparticles cause apoptosis in BEAS-2B cells through the caspase 8/t-Bid-independent mitochondrial pathway. Toxicol Lett 2010 Jun;196(1):21-27. 17. Nair P, Lu M, Petersen S, Ashkenazi A. Apoptosis initiation through the cell-extrinsic pathway. Methods Enzymol 2014;544:99-128. 18. Palchaudhuri R, Lambrecht MJ, Botham RC, Partlow KC, van Ham TJ, Putt KS, et al. A Small molecule that induces intrinsic pathway apoptosis with unparalleled speed. Cell Rep 2015 Dec;13(9):2027-2036. 19. Masumi H, Hasanzadeh H, Rezaei-Tavirani M, Jadidi M, Nikoofar A, Nasr R, et al. Effect of nano-titana in radiotherapy: An in vivo animal study. J Mazandaran Univ Med Sci 2017;27(149):1-13. 20. Meng H, Xing G, Blanco E, Song Y, Zhao L, Sun B, et al. Gadolinium metallofullerenol nanoparticles inhibit cancer metastasis through matrix metalloproteinase inhibition: imprisoning instead of poisoning cancer cells. Nanomedicine 2012 Feb;8(2):136-146. 21. Thurn KT, Arora H, Paunesku T, Wu A, Brown EM, Doty C, et al. Endocytosis of titanium dioxide nanoparticles in prostate cancer PC-3M cells. Nanomedicine 2011 Apr;7(2):123-130. 22. Moghadam FF. Using nanoparticles in medicine for liver cancer imaging. Oman Med J 2017 Jul;32(4):269-274. 23. Kawasaki ES, Player A. Nanotechnology, nanomedicine, and the development of new, effective therapies for cancer. Nanomedicine 2005 Jun;1(2):101-109. 24. Jain S, Hirst DG, O’Sullivan JM. Gold nanoparticles as novel agents for cancer therapy. Br J Radiol 2012 Feb;85(1010):101-113. 25. Liu Y, Miyoshi H, Nakamura M. Nanomedicine for drug delivery and imaging: a promising avenue for cancer therapy and diagnosis using targeted functional nanoparticles. Int J Cancer 2007 Jun;120(12):2527-2537. 26. Premanathan M, Karthikeyan K, Jeyasubramanian K, Manivannan G. Selective toxicity of ZnO nanoparticles toward Gram-positive bacteria and cancer cells by apoptosis through lipid peroxidation. Nanomedicine 2011 Apr;7(2):184-192. 27. Li Q, Wang X, Lu X, Tian H, Jiang H, Lv G, et al. The incorporation of daunorubicin in cancer cells through the use of titanium dioxide whiskers. Biomaterials 2009 Sep;30(27):4708-4715. 28. Wang K, Kievit FM, Zhang M. Nanoparticles for cancer gene therapy: Recent advances, challenges, and strategies. Pharmacol Res 2016 Dec;114:56-66. 29. Jonuleit H, Bopp T, Becker C. Treg cells as potential cellular targets for functionalized nanoparticles in cancer therapy. Nanomedicine (Lond) 2016 Oct;11(20):2699-2709.